ROTOMECH regularly conduct the training courses for the Engineers, at major locations as well as "On Site" to enhance the knowledge & to upgrade the skill of Engineers / Technicians. These Training Courses are conducted by our highly experienced ,qualified personnel. During the Training courses ,a very useful Training manuals is also provided to the participants. These training courses are found to be very useful & advantageous by more than 25,000 participants trained by us so far, our training courses are field /practical oriented ,supported by our own case studies. The participants are provided certificate as appreciation / gesture of their participation in the training course. 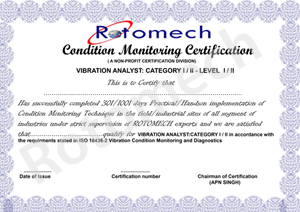 ROTOMECH with 25 years of rich experience & in depth knowledge of Condition Monitoring Technique, have developed an in house exam that follows the ISO 18436.2 standard, and the ASNT Recommended Practice SNT-TC-1A. Level I & Level II Certificates are issued to qualifying candidates. All ROTOMECH Engineers has to go through this rigorous training program with Level I & OR Level II certification. Level I certification is provided to the Engineers after 301 days of Hands on ,field experience & Level II certification is provided to the Engineers after 1001 days of Hands on Field experience under supervision of ROTOMECH experts. These certification is not provided out of 4/5 days training in five star hotels against payment.